It’s what you have all been asking for and we have delivered. 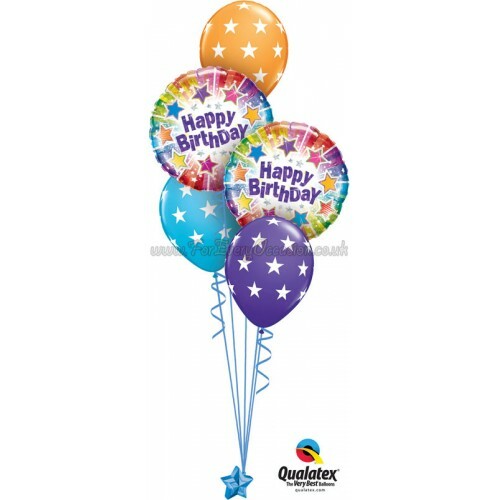 Our customers have asked to be able to order balloons out of hours and be able to collect in store. Our NEW Click & Collect service is simple to use. Select the bouquets you want, select the date you want to collect them pay conveniently with PAYPAL and your order will be waiting for you to collect when you are ready. Give it a try now Click Here or select Click & Collect from the Menu Above. 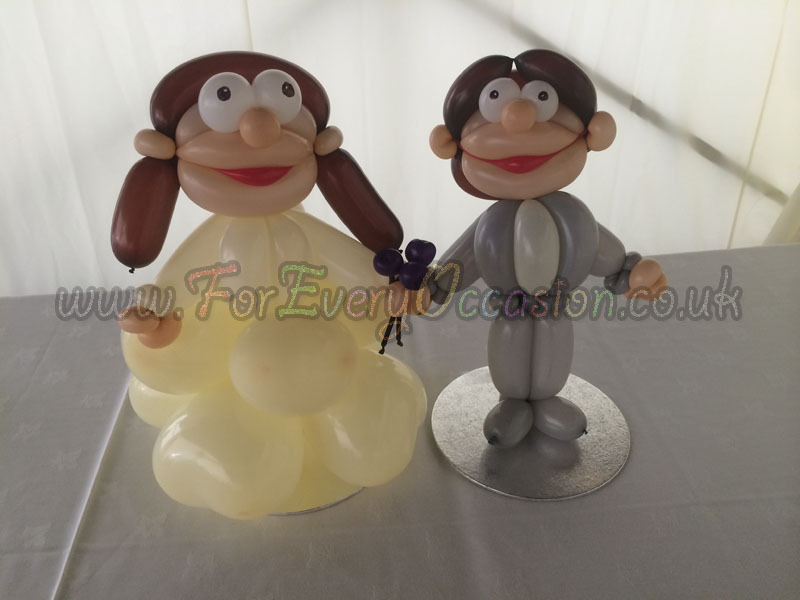 This Sunday we had the pleasure of decorating a wedding for a lovely couple Louise & Chris. The venue was the Faenol Fawr Hotel in Bodelwyddan. We had been asked to highlight 4 key areas at the wedding, the entrance, the cake table, the top table and the dance floor. By the door. 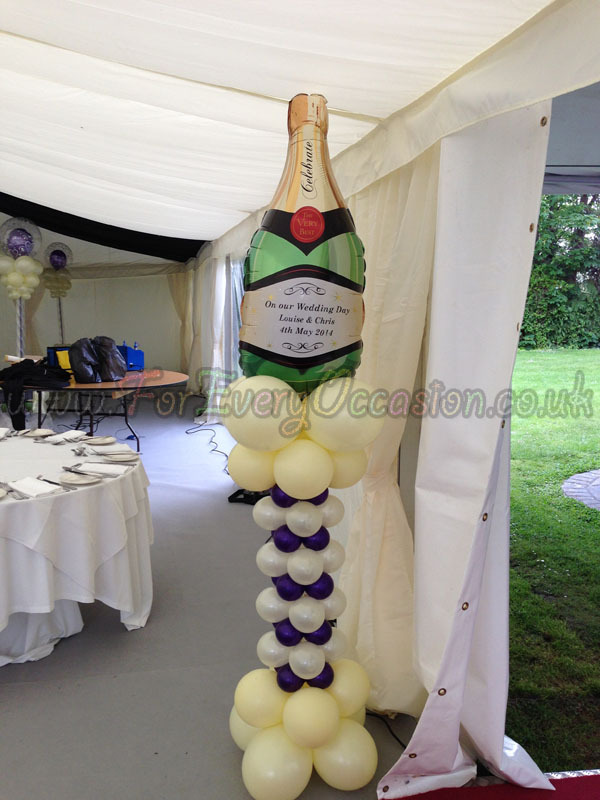 we went for a simple champagne bottle pillar, personalised with a message chosen by the Bride & Groom. For the Cake Table, we created a very simple string of pearl arch and accented it with our very popular Lootle Bride and Groom characters. The top table, being one of the main focal points of the wedding day, was decorated using our stunning heart frame. 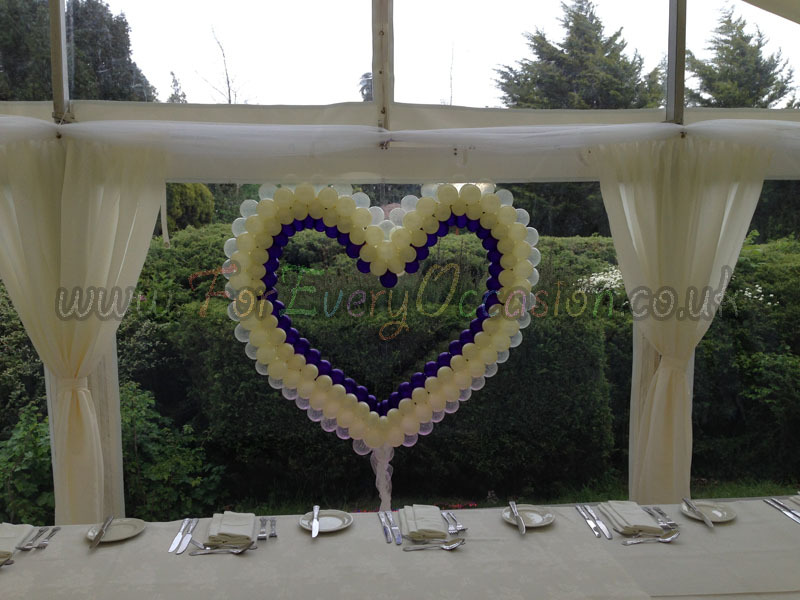 The use of an ivory heart surrounding a purple heart in the centre and a clear heart around the outside works as a perfect backdrop for the bride and groom whilst sat at the top table. For the dance floor, the couple wanted a wow factor that was also elegantly stunning and classy. We surrounded the dance floor with 4 of our elegant pillars. 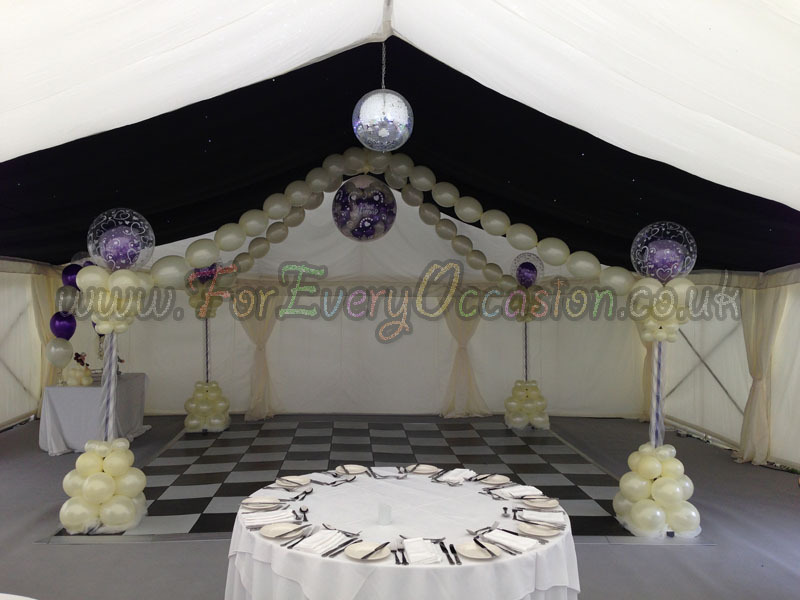 These were then linked to the centre point of the dance floor to create a beautiful canopy. In the centre of the canopy we suspended a 3ft exploding balloon that, when remotely detonated by the DJ, showered the happy couple with 100 balloons, perfect for any wedding day. 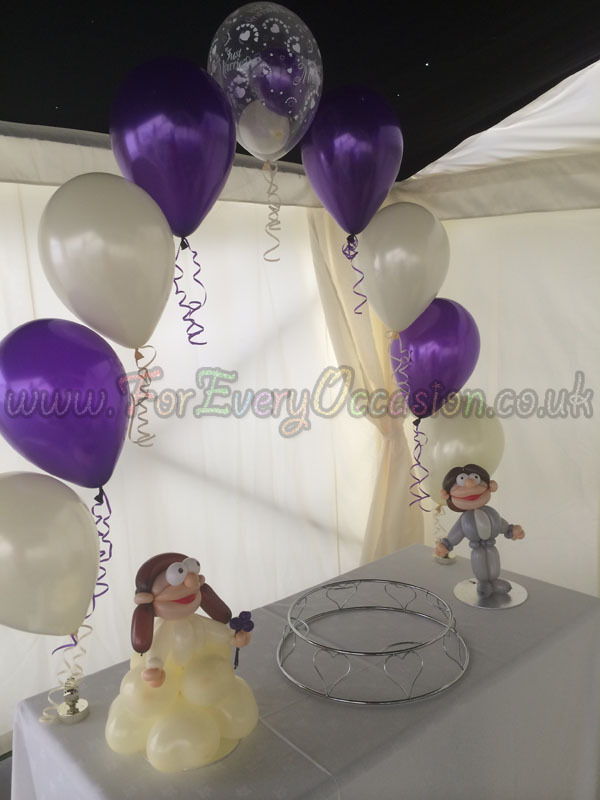 The Bride & Groom were absolutely delighted with what we had created and couldn’t believe how our balloons transformed the marquee and gave that ‘WOW’ factor which we all seek to create. Great result for us. Enter your details below to receive our exclusive discount offers.